This gorgeous and wooden funeral urn is crafted in the USA, in an Oregon woodshop with an idealized representation of the classic "Footprints in the Sand" poem. The sandy beach wood inlay art scene showcases an oceanview beach scene with fooprints, crashing waves, a rustic sailing boat, and a symbolic cross in the sky that represents your loved one's final journey home. The laser etched inlay is composed of select hardwoods in their natural colors or light stains, set into the wood urn to give it a lifelike look and feel of three dimensions. A lovely memorial urn tribute to the man or woman of faith. The 3D inlay art scene is laser engraved with a variety of hardwoods that accent the beach seaside scene. This funeral urn has an industry-standard adult urn capacity of over 200 cubic inches. This capacity is equal to the cremated remains (or "ashes") of a person who weighed up to 200 lbs. These wooden urns are individually crafted to order right here in the USA. Please allow 1-3 business days for production. The Footprints in the Sand Urn is available in your choice of premium Mahogany, Maple, Oak, or Walnut wood, made in America in our enduringly popular Ambassador funeral urn shape. Thick, premium hardwoods are used, making this a solid and lasting heirloom urn with a natural clear finish. Usage: Bottom-opening panel attaches with standard screws. To open, simply remove the screws and bottom panel, place the plastic bag containing the cremated remains into the urn, and re-attach the panel. No need for sealant or glue. Exterior dimensions: 11" wide, 9" high, 7.5" deep. Urns Northwest has been your premier source for cremation urns since 2000, with the highest standards in craftsmanship, quality, and customer service. 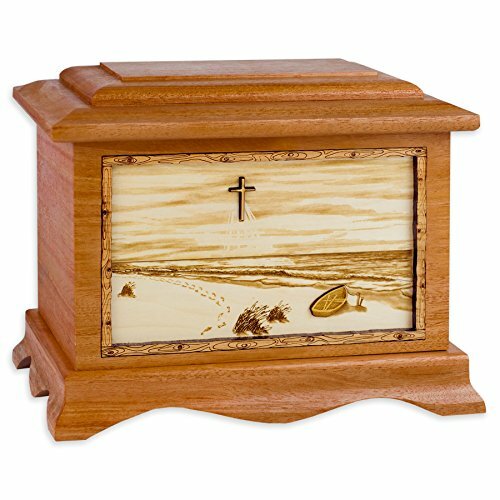 Premium wood memorial urn with Footprints in the Sand beach inlay art, made in the USA in an Oregon woodshop. Crafted using your choice of rustic solid Walnut, Oak, Maple, or Mahogany wood. Standard sized adult funeral urn capacity of 200 cubic inches, ideal for an adult who weighed up to 200 lbs. See detailed sizing info below. Outer dimensions of the wood urn measure 11" wide, 9" high, 7.5" deep. Made in the USA - TO ORDER - for you within 3 business days. Contact us at 877-900-5309 to arrange expedited production and delivery. Faith-centered beach and ocean art inlay scene in 3 dimensions with wood etched inlays of Footprints in the Sand, complete with a Christian Cross in the sky representing your loved one's journey home. If you have any questions about this product by Urns Northwest, contact us by completing and submitting the form below. If you are looking for a specif part number, please include it with your message.